Entropion is a condition where the eyelid rolls inward, causing the eyelashes to contact the surface of the eye. Either upper or lower lids may be involved, or a combination of both. Most often both eyes are affected. This condition is associated with discomfort and may result in damage to the eye which may be severe enough to cause partial or complete loss of vision. Squinting and tearing are the most common signs observed. A Shar Pei puppy with severe entropion complicated by heavy brow folds. 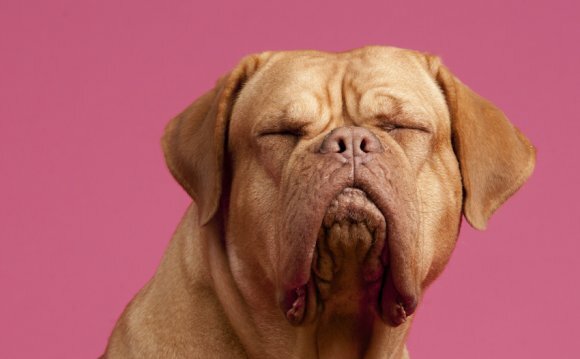 Entropion is seen as an inherited condition in many breeds of dogs, including the Shar Pei, English Bulldog and Chow Chow. Often the severity of the entropion is related to the amount and weight of the skin and wrinkles covering the head and face and the conformation of the skull. Permanent treatment for entropion requires a surgical procedure to remove a narrow segment of skin and muscle from the eyelid with stitches used to evert the eyelid to a normal position. The sutures are removed in 2 weeks. In breeds where entropion is accompanied by heavy face folds, or in cases where surgery is necessary before a dog is fully mature, it is not unusual for more than one surgical procedure to be required. Entropion may occur in very young puppies, soon after eyelid opening at two weeks of age. In these cases, it is desirable to avoid the risks associated with a general anesthetic and to delay a definitive surgical correction until the dog is more fully grown. Surgical staples may be placed in the eyelids using a topical anesthetic. The staples are very well tolerated by the pups although care must be taken to prevent the dam or littermates from chewing at them. The staples are replaced every three to four weeks until the condition resolves with age or until a definitive surgical correction is indicated.